It's a typical stereotype. The teenager is in a "rebellious" stage. You see it on the TV often enough. The teenager is obsessed with their phone and thinks he knows better than his parents. The kid is disrespectful towards his parents and teachers, and, as said before, is glued to his screen. And yet, every parent is told that their teen will "Go through that stage". As a teenage girl myself, I find that stereotype demeaning and just not true. I'm not glued to my phone (I don't have one), I try and give my parents all the respect in the world, and I definitely am not going through what our culture calls "A rebellious stage". But, in a way, I do want to rebel. I want to rebel against the standards our culture has set for me. I don't want to be like every other teenage girl who can't get over the latest teen sensation. I don't want to be glued to a screen and not notice God's beautiful world. I don't want a boyfriend. And I certainly don't want to rebel against my parents. So, is it me, or do is our world telling us to rebel against the wrong things? And why are so many teens going along with it? Why don't we show the world that not all teenagers are self-centered emo's that don't care about anything except for themselves? And that, my dear friends, is what a rebel is. We need to break through the standards. We need to show the world that we care! But, if you're still noot sure what in the world I'm talking about, I will give you a great example. She is the perfect example of a rebel. She didn't care if she was the standout, she was confident in her faith and not afraid to share it. She wanted to rebel against the modern culture. Wow. Inspiring huh? That is what a rebel is. 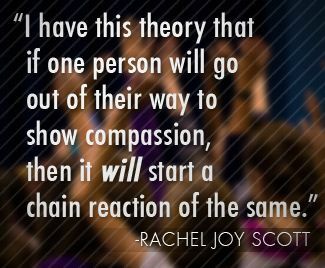 To rebel against the modern culture, and start a chain reaction of compassion. 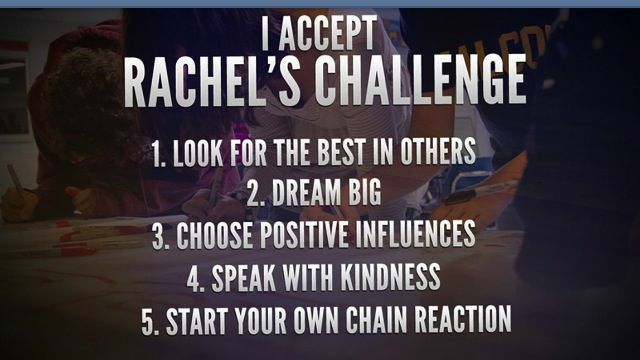 And so, my friends, will you accept Rachel's challenge? Will you be a rebel? I hope so.